Smyrna (modern Izmir) is located on a deep sheltered bay of the Aegean Sea. 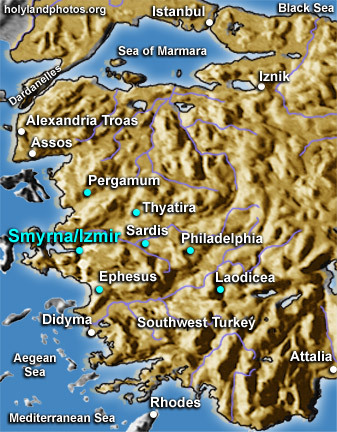 It is located at the western end of a very important ancient road which came from the east (Syria, India, China) to Laodicea, and from there to Smyrna via Philadelphia and Sardis on the Hermes River. By the time of the early church, Smyrna was a center of emperor worship and a very close ally of Rome. It is the second of the seven churches that John addressed in the book of Revelation (1:11; 2:8–11). The "crown of life" mentioned in 2:10 may refer to the wreath given to a victorious athlete or it might refer to the citadel which towered over the city. John prophesies about the persecution to come, and indeed Polycarp, who was burned for his faith in the stadium at Smyrna, was one of the first Christian martyrs (at the age of 86 in A.D. 156). Currently the major archaeological remains are the citadel (Kadifekale), the agora, and an area of the ancient city excavated by Akurgal. The archaeological museum of Izmir is filled with outstanding artifacts from the city and vicinity.